It started in some obscurity with unclear origins after the Civil War. The hundreds of thousands of graves of soldiers who died to make us a truly free nation seemed to deserve a little sprucing up once a year as a way to honor their sacrifice. Weeds were cleared, flowers were placed, and a small flag was set to decorate the graves of those who made the ultimate sacrifice. “Decoration Day”, as it became known, apparently started even before the war was over in some places. The time of year was picked simply because the start of summer was when the earth itself was renewing. The first declaration of a national holiday came in 1868. The Grand Army of the Republic, a Union veteran’s organization that maintained a military structure, called on all its members to have a unified Decoration Day on the last Monday of May. They had an enormous amount of political pull, so the celebrations were held across the North were often closely tied with government. It wasn’t until after WWI that the South observed the same Decoration Day. The day and name “Memorial Day” wasn’t officially recognized by the Federal Government until 1967. 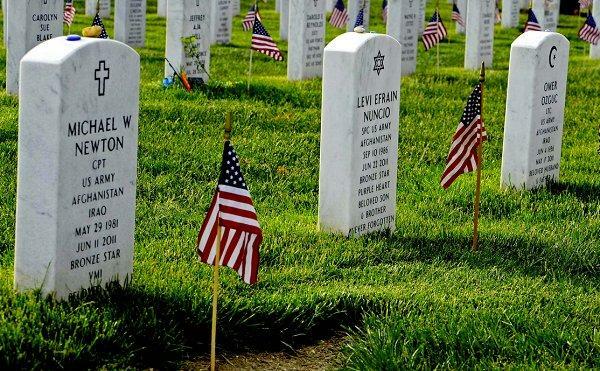 Lack of official recognition never stopped anyone in the USofA, or at least it didn’t used to, so Memorial Day has long been one of our cherished traditions. I was once in Brownwood, Texas and saw the graves of the local cemetery carefully decorated with the appropriate flags. A US veteran got the stars and stripes, a Confederate veteran the stars and bars, and the veterans of the Texas War of Independence the lone star. One grave had all three flags fluttering under the softly simmering Texas sun. 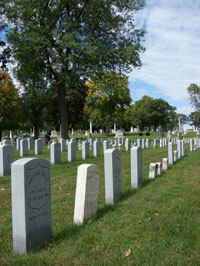 Casualties of Afghanistan, at Arlington. Note the religious symbols on these three graves. It is difficult at times to keep alive the memories of those who came before us and what they did to make the world the way it is. It seems even harder to honor their contribution by making it more rare. Since 2001 there have been 2,031 who gave the ultimate sacrifice in Afghanistan and 6,518 in Iraq. These deaths are no less noble than those who went before, but I can’t help but feel that they came because others in our government were too lazy or cowardly to do their jobs and find a better way to solve our problems. Shedding so much blood for political expedience is a terrible crime, but it does not lessen the lives given in service one bit. Those under the white tombstones gave far more than what most of us are ever asked to give for the precious gift of liberty. The least we can do is keep their markers and spruced up. That is what the day is for, and always has been. It is a spontaneous holiday, a pause before the heat of summer. It should also help us to understand where we must go. Those white tombstones mark more than the past, they tell us who we are as a people, today and for as long as we remember. This entry was posted in People & Culture and tagged Afghanistan, Civil War, Iraq, Memorial Day, ultimate sacrifice. Bookmark the permalink. Happy Memorial Day to all the VETS out there who served. Let’s remember all of you, especially the ones that didn’t come back today. It’s a great holiday that is more than a picnic. Thanks for reminding us of it. I hate to sound like I am against the military but you put it very well. They are asked to do things they shouldn’t be but they salute and just do their best. We should not ask them to do so much in the first place and work for peace when we can! I think that is the key. They can’t do everything, but they do so much so well. We can’t always rely on that as heavily as we do – it costs us so much in lives and money.